Realizing Your Ultimate Potential. There is little in life that is as important as becoming who you really are. To spend your life avoiding, resisting, or neglecting your own potential is to spend your life fighting your Self! We all fear ridicule and failure, or worry about what spouses, children, or friends will think if we make any deep or serious changes in our life. However, in order to realize your full potential you have to face these fears and go beyond them. The questions to ask yourself are, “Do you want to spend the rest of your life with someone who doesn’t want you to be the best and most you can be? Are you willing to sacrifice yourself on the altar of fear? Are you preventing your spouse or child from doing what they would love to do – or are you in full support of their dream? If you are supporting their dream, why isn’t yours just as important?” One thing is certain, if you keep doing what you’ve always done, you’re going to get what you’ve always gotten. When thinking about your own potential, be aware that the unfolding of this potential is often a series of zigzag steps and stages, each one unfolding into the next. A mother of three young children developed an interest in sewing her children’s clothing and went to take a sewing class. A few years later she started an alterations business, then went into dressmaking, next to making curtains and quilts for others, which led to a small interior design business, and eventually to becoming a design engineer for one of the Big Three car companies putting together car interiors. Realizing your potential is not like a “get rich quick” scheme. It is more like a “get rich slowly” approach to deepening who you are. It’s not really easy to unearth your potential because you have to make permanent changes in your ideas about how life should be, your attitudes toward others, the way you handle your emotions, and your willingness to take responsibility for your life. You never know where those first uncertain, even shaky, steps will lead you, but you don’t really need to know that when you start out. You just need to accept that there will be some point in the future when you will look back and see that you have new capacities, new boundaries, new courage, and a whole new worldview. What is your potential? Although no one else can say exactly what your potential is, potential is like an acorn. Looking at the acorn you might never guess that it has the potential to become a huge, beautiful oak tree. But the acorn knows exactly what is possible for itself. Just put it in the right environment, give it a little water and sunshine, and it starts its journey without hesitation. A few years later it may already be taller than you, and in a decade it can become a towering giant. In the same way, you know what you would love to do. If you are like the rest of us, you have something you have always wanted to try, to experience, to do, to become. Like many people, you probably got caught in the nets of immaturity and inexperience and have been working to make ends meet ever since. Perhaps you’ve been avoiding taking responsibility for yourself and have gotten into the habit of blaming every little person and circumstance for the things that upset or disappoint you. Sometimes we get the idea that work is something to “get out of” or to avoid as much as possible. This is tragic because work is a form of self-expression and your work in the world is your gift to yourself – and then to the world. You owe it to yourself to find out what you like to do, then develop that skill set, and work at it until you become proficient and can do it with passion and enjoyment. The more you like what you do, the more this energy spills over into the world with good effects in all directions. Realizing Your Ultimate Potential will help you sprout your own acorn and unfold the You you’ve always wanted to be. It provides a window into yourself that helps you see yourself differently, think about your life in new ways, face the things you may have been avoiding, and understand who you really are. It takes you deep inside yourself for a look at the hidden you standing in the shadows, and slowly coaxes that new you out into the light of day. 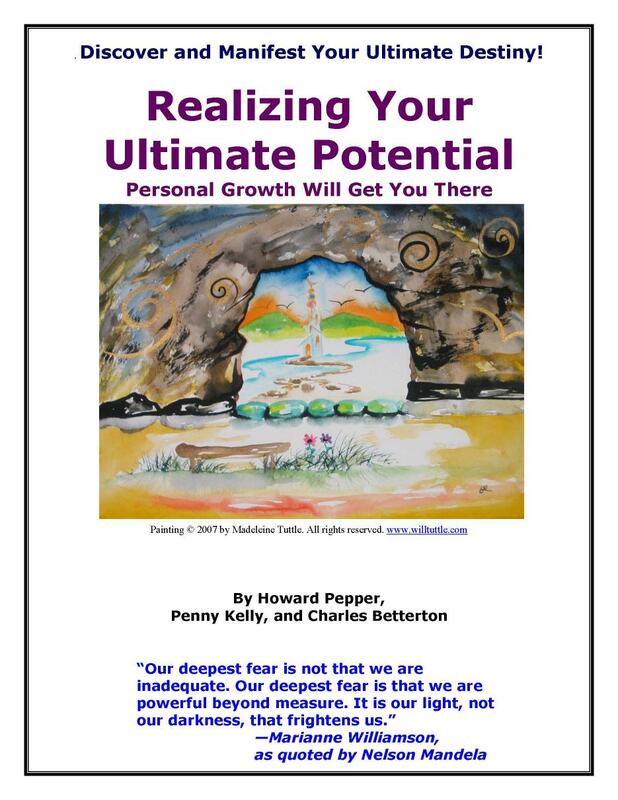 Realizing Your Ultimate Potential includes pre and post self-assessment quizzes, featured resources, application exercises and tools for planning what priority action steps to take to achieve your ultimate success in this area of successful living. This resource is one that will serve as a roadmap for your plan of growth for years to come Simplify and coordinate your growth steps by coming back repeatedly to this succinct resource. Step by step guides for developing skills that you will use for other aspects of life as well Enhance your control of life and getting what you want—what you learn here will naturally affect all you do. Realizing Your Ultimate Potential also includes featured resources including printed and digital book, audio and video programs, seminars, workshops, webinars, teleseminars and live events from some of the top resource providers in the world. Realizing Your Ultimate Potential is a Treasure Chest packed with over 50 pages of original content, fun and insightful self discovery assessments, Master Goals Setting Forms, Implementation Action Planning Exercises and several hundred dollars worth of FREE BONUSES. or you can Click Here to learn more about how to own the complete Ultimate Destiny Success System with over 1,000 pages, featuring 14 programs and over $1,000 worth of bonuses for only $77. Greetings and welcome to your “Treasure Chest” and resource center for realizing more of your unlimited potential as you discover your dreams and manifest your ultimate destiny. Please participate and help us develop the most useful supportive community created to help individuals, organizations and communities realize more of their potential.